On 13/9/2013, a Judicial source in the Illegal Earning Administration announced, that Former President Mohamed Morsi’s wealth inflated in Money and Real Estates after he became a president. 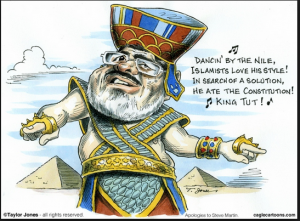 The Illegal Earning Administration checked Mohamed Morsi’s family’s Financial Disclosure and declared that it is not correct based on new evidences proves the inflation of their wealth. Investigations revealed the big difference in Morsi’s wealth while he was the leader of “Freedom and justice Party” (Brotherhood political Party), and his wealth after one year from the date he became a President. 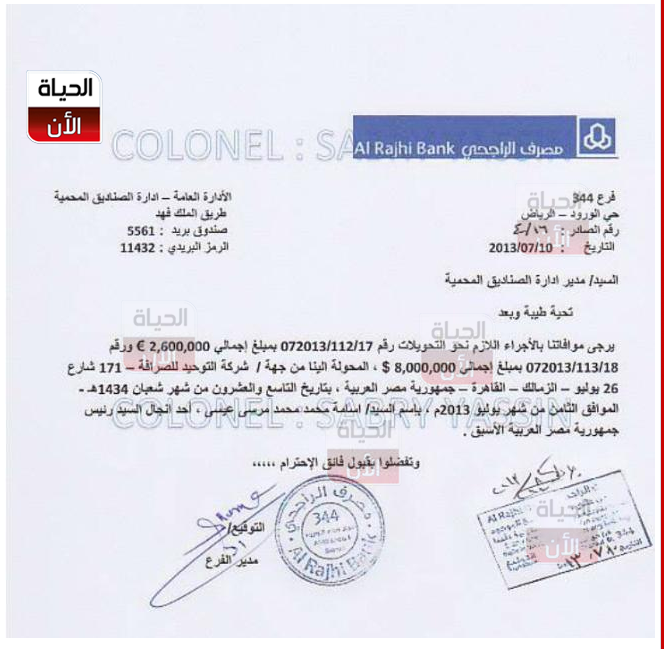 Documents show his Personal accounts in banks inside and outside Egypt, which reached 2 Billion Egyptian Pounds. Real Estates ownership including a villa in Fifth Settlement in Cairo Egypt with value of 40 Million Egyptian Pounds. His ownership of a land in Fifth Settlement area in Cairo. His ownership to a land in Sharqiya City. His ownership to a land in Hurghada City. His ownership to Two Modern Mercedes Cars. 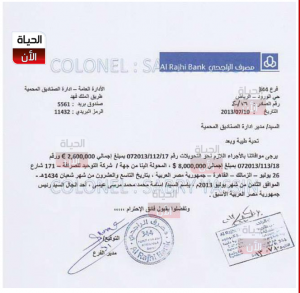 On 10/11/2013, Colonel Sabry Yassin the Chief of the Egyptian Veterans Club revealed Documents showed the transfer of huge sum of money transferred by Ossama Mohamed Morsi (the son of Former President) from Egypt to Saudi Arabia, 5 days after his father got ousted by 30/6/2013 revolution. Eight Million US Dollars, transfer receipt reference number 072013/113/18.